Even with the ability to consume music digitally, vinyl still holds a special place in our hearts. There’s something about holding the physical copy in your hands. The crackle as you put the needle down. It’s a nostalgic sound that can’t be replaced. And that’s why there are many record stores thriving throughout Michigan once again. Here are a few of our favorites. Rumor Has It in Niles boasts plenty of vinyl on hand, in both new and used records. A great start, sure, but Rumor Has It also delivers in materials to play that music on in both the latest high-end electronics and vintage stereo components. Vintage collectibles are also on hand here, from posters to jewelry and more, so you can complete your nostalgic rock experience as you see fit. Kalamazoo—which won't surprise anyone to discover is a college town—has some vintage vinyl of its own afoot in Satellite Records. If you're looking to pick up some new vinyl, then by all means, stop in. If you're looking to dispose of some old vinyl—maybe in pursuit of picking up some new—they'll also buy it from you. Used goods are aplenty here, and even if you're not in Michigan proper, you can still hit their webstore, where over 17,000 items are on hand and ready to ship. Hillsdale's Checker Records has something of a unique prospect to it, as it will surprise you to find that it took home top honors on MLive's Best Coffee Shops in Michigan list. We know, this is a list about record stores, and that's exactly what Checker Records is. While you're getting your vinyl fix, however, you can also get your caffeine fix thanks to the coffee shop included in Checker Records. Checker Records is also known for sponsoring its own annual street dance in summer, so that just tops things off. It should be no surprise that Motown is home to a lot of record stores, and Dearborn is no exception. Home to Dearborn Music, this store not only sells but buys most physical media, ranging from vinyl to Blu-ray. Once you're in a mood to buy yourself, however, that's where things really ramp up. Are you looking to preorder upcoming releases? Are you looking for new equipment? Are you looking for used music? No matter what you're after, Dearborn Music can likely either find it for you or has it on hand. Reverend Charles' Dodds' Record Shop in Grand Rapids has something of an unusual provenance behind it. Starting life as Cole's Record Store in 1947, it stayed that way until 1951, when it became Gerry Dodds' Record Shop, and stayed that way until 2013. After 2013, Rev. Charles Preston Smith stepped in, and the name became the absolute mouthful you see this listed under today. Also apparently Michigan's oldest record store, Reverend Charles' not only stocks plenty of vinyl, but also boasts a complete museum as part of the operations as well. Head on up to Jackson if you want to check out CK Barrymore's, which is also the home of Crazy Bob's poster design, and also plenty of memorabilia surrounding the Goose Lake Music Festival. Aside from that, you can pick up vinyl of most every type and description here, along with T-shirts, incense, and quite a bit more. They've even got a range of detox products, which potential buyers may want to be careful about, and a complete webstore operation to pick up at least some of what you'd like without even hitting Jackson. It's not really surprising that Ann Arbor, home of one of Michigan's biggest universities, would have a record store, and Encore Records definitely qualifies as one of the leaders around. With its own Discogs store for online sales—they've got over a thousand items—the store will both buy and sell vinyl, CDs, DVDs and Blu-ray, alongside tapes in cassette and reel-to-reel. Check out their sheet music for when you want to play your own music, as well as memorabilia from the past history of music. Considered not only the best music store in the Lansing area—and there are actually a few stores in the region—but also a National Top 10 Music Store by Sports Illustrated, Flat Black and Circular has an impressive provenance behind it. The shop itself offers vinyl, along with CDs and DVDs, covering both the biggest names and the smaller indie releases as well. There's even a setup in place that lets shoppers listen to the music in question before buying, which is a pleasant bonus. Proving once again that Traverse City has just about anything you could ask for, RPM Records receives accolades for its range of options. Check out both new and classic vinyl, as well as players and equipment to actually pull the music from the vinyl. Cleaning products help keep everything in fighting trim, and there are even a few collectibles on hand too, so that you can have some of the rarest examples of music history on hand at any given time. Radio Wasteland in Midland is something special. 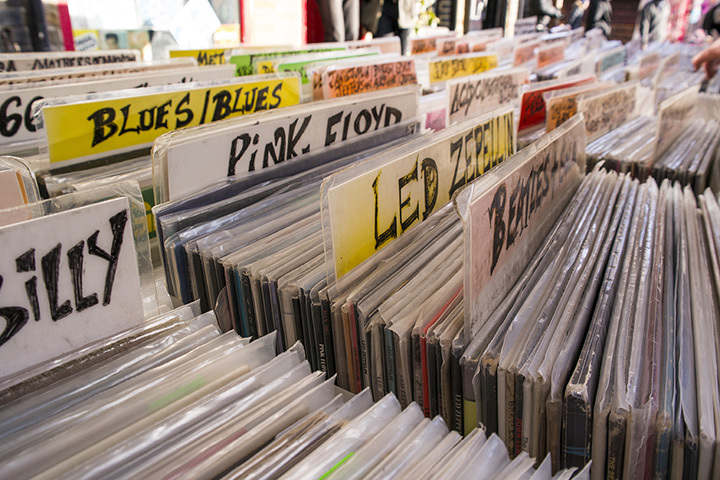 Home to new and old vinyl alike, as well as a close connection to local classic rock radio stations complete with giveaways, there's a lot to like about Midland's major music presence. So stop in and have a look around.